Decorative interior overlays are being used more and more by homeowners, builders, hotels, and restaurants as the flooring material of choice. 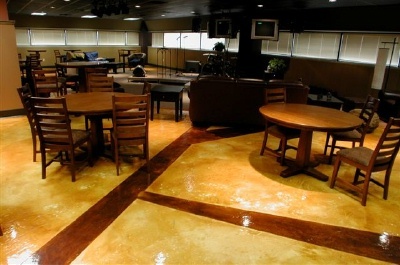 The design options and versatility of decorative interior concrete overlays compared to traditional types of flooring are endless. The many different choices of colors, textures, and stamped concrete patterns allows for creativity that you can't get from carpet or ceramic tile. With a stained and stamped decorative concrete overlay, you can mimic natural stone, slate, fieldstone, wood plank, tile, the list goes on and on. If you have a basement floor or interior radiant floor heating, a decorative concrete overlay would be a great choice for many reasons. Maintaining interior decorative concrete overlays is a breeze, after applying a good concrete sealer, and/or a concrete floor wax, it just needs vacuuming and occasionally a going over with a damp mop. This will keep the floor looking like new, and make you very happy you chose a concrete overlay versus another kind of interior flooring.